Mangaluru, Mar 7, 2015: When road safety is the matter at stake in the cultured city of Mangaluru, it is always unclear who should give way? While motorists care a hoot for pedestrian safety, pedestrians don’t dutifully follow traffic rules. 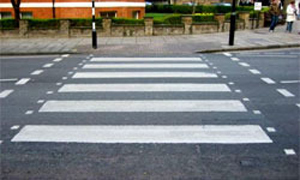 There are a number of zebra crossings on many roads. While motorists speed as if they expect to take off like air craft least caring about crushing down pedestrians trying to get across zebra crossings, pedestrians too cross roads without a care. When one person crosses, others follow with out checking for themselves. Mob mentality can be seen on most stretch, mainly State Bank (with its happazed road situation), Bunts Hostel near St Aloysius Primary School, PVS Junction Road, St Agnes at Bendore, SDM and Besant College on MG Road, Hampankatta, K S Rao Road and others. The problem gets worse as pedestrians cross the road anywhere needed, unmindful of vehicles zooming past. It’s not uncommon to see such shocking recklessness. place. With two way traffic on the road towards Hoige Bazar it is the most dangerous area with accidents waiting to happen. Particularly, the heavy trucks carrying cement from good shed road through this point (Rosario Church road) must be controlled. Now vehicles use this road to park on both sides and a Auto stand has also come up. The former chairman, road safety sub-committee, Kanara Chamber of Commerce and Industry, suggests some measures to fix the problem but, most importantly, police must enforce the rules. At Bunts Hostel and PVS Circle, he says that after marking the zebra crossing and stop lines on all three roads, pedestrians should be allowed to cross the road for a minute after completion of one round of vehicular movement at this T-junction. The signal timing should be 60 seconds as 90 seconds will lead to traffic backing up. He says after Hampankatta intersection was made signal-free, there’s no safety for pedestrians. Here also, he suggests signal lights of one-minute duration for pedestrian crossing. At Kankanady bypass road, he said, the available space is wasted for a rickshaw stand and it could have been used for movement of vehicles. Indeed there is a lot that the concerned authorities need to do in this regard.